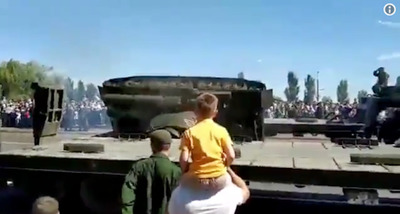 An old Russian tank that had just led a military parade in western Russia on Thursday was being loaded onto a trailer when it embarrassingly barrel-rolled off the flatbed. The driver was uninjured, and several videos of the T-34 tank flipping off the trailer have since been uploaded to social media. “At about 12:10 on August 23 a T-34 tank rolled off the platform and capsized while being loaded on a trailer,” the Russian military told TASS, a state-owned media outlet. The tank driver was uninjured, TASS reported. Several videos of the tank fail have since been uploaded to social media. The military parade was celebrating the World War II Battle of Kursk, an important Soviet victory over Nazi Germany that ended 75 years ago on Thursday. The parade appropriately included 75 military vehicles, including T-72B3 tanks and BMP-2 armoured personnel carriers, TASS reported. The incident comes less than a month after Russia’s navy had its own fail on Navy Day when a Serna-class landing craft crashed into a bridge.